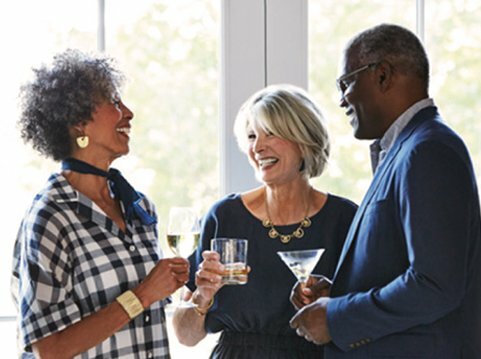 When you arrive at Bedford Court, you'll quickly notice that our community is situated in an ideal location, close to shopping, restaurants, live theatre, and physicians. We are minutes away from metro by car, enabling easy access to the cultural attractions of Washington D.C.
You will also notice how warm and friendly our residents are. You'll often find various groups gathering in our lovely common spaces, both indoors and out, to share a cup of coffee, discuss the day’s news, play a game of bridge, or enjoy a glass of wine. Our residents and families will tell you how much they enjoy being a part of the Bedford Court family; enabling all residents the freedom to enjoy the numerous activities and local events, as well as the peace of mind that comes with knowing excellent care is available should they need it in the future. Included in your monthly fee is access to our unparalleled dining program, led by our executive chef and featuring a rotating menu of local, fresh gourmet meals. This includes one meal per day—lunch or dinner—plus a complimentary breakfast six days a week, and a sumptuous hotel-style brunch on Sundays. We invite you to call today to schedule a tour. We would be honored to show you our community, discuss the included amenities, and answer any questions you may have about life at Bedford Court. Book online, call 240-681-2022 or email us to schedule a visit. We look forward to meeting you!